Jack Butland says Gareth Southgate has reassured him he can remain part of the England squad, despite playing his club football for Stoke City in the Championship. The goalkeeper remained with the Potters following their relegation from the Premier League last season, and was the only member of the most recent England squad not to play for a top-flight club. 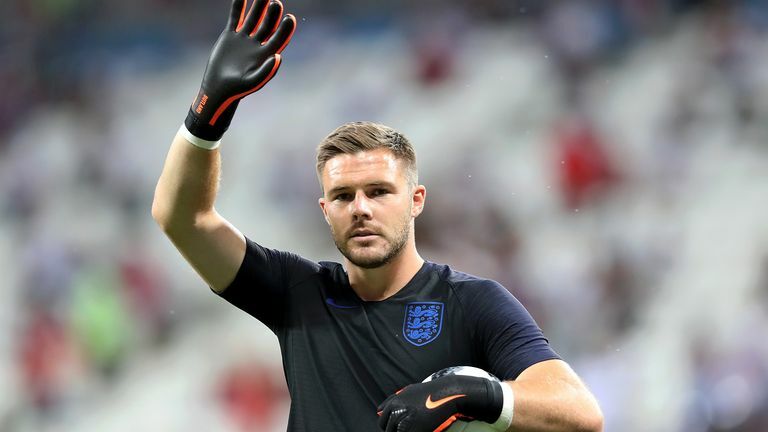 Former Stoke and England 'keeper Gordon Banks recently suggested Butland may have to leave the club to keep his place in Southgate's side, but the 25-year-old does not see it that way. He said: "You can argue that the standard is different (in the Championship), but it's still a very demanding league and I still have to be at the top of my game. Butland started England's 1-0 win over Switzerland on Tuesday evening, but was involved in two incidents when trying to play out from the back that nearly gifted their opponents a goal. He nearly scuffed a pass into his own goal when trying to find Harry Maguire, and then played James Tarkowski into trouble, presenting Xherdan Shaqiri with an opportunity that he spurned. However, Butland insists he wants to continue playing in Southgate's expansive style, saying: "It's not particularly difficult if you're comfortable doing it. We've done it all week in training.